There's more room for gay celebrities in the Philippines. That would be absolute and a perfect example of "the more, the merrier". After Vice Ganda, Ate Gay would be a super fun addition to the widening field of openly gay comedians who are having a strong following on television and the movies. a parody of his hilarious comedy skit of the same title. His/ Her time could be now. Or starting last Friday, November 30 to be specific as I and the rest of over 9,000 people (this is just my estimate) at the SM Mall of Asia Arena laughed their hearts out at Ate Gay's first major solo concert. Dubbed "Ako Naman! Ate Gay sa Arena: The Call Me Beki Concert", Ate Gay himself admitted that he showed hesitations earlier in holding a concert in such a huge venue. But he opted to grab the opportunity right away. He would be glad he did as it was a success. Helping Ate Gay make it a comedy fest are his guests Aisa Seguerra, Allan K, Aegis, The Company, X-Factor Philippines winners KZ Tandingan, Gab Maturan and Daddy's Home, the Sexbomb Girls, Stand-Up comedians, Le Chazz, Tami Brown, Boobay, Petit, Kim Idol, Anton Diva, Michelle O'Bombshell, and the Talentadings Duo, Miss International Queen 2012 Kevin Balot, John Lapus, and the Superstar herself, Nora Aunor. 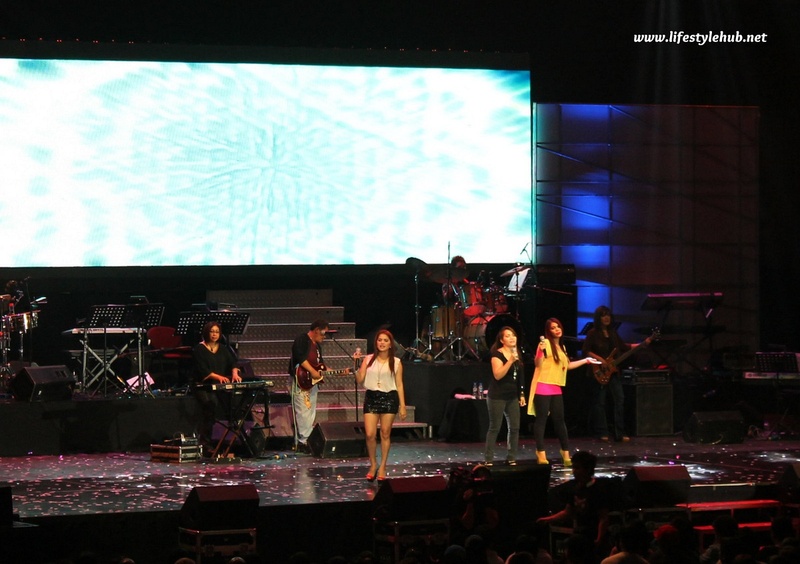 The concert was put together in segments where Ate Gay never failed to amuse the audience. Even his so called "recycled" jokes and punchlines were greeted by the Arena with applause and huge laughs. The concert started with a spoof where Ate Gay, in his make up and fancy dress, needs to hire a tricycle to get to the venue. As promised, he started the show with a grand entrance as he harnessed himself, traversing from the other end of MOA Arena to the stage. He performed a medley of Gloria Estefan's "Conga Beat", the Korean megahit "Gangnam Style" and Rihanna's "Where Have You Been" with a touch of the Nora Aunor tone, of course. Bailes de Luces, a dance group from Bacolod, helped stage a colorful opening number for the comedian. The Aegis band performed "Ulan"
The second segment, where Ate Gay shared his previous job experiences and his life as stand-up comedian, reinforced further Ate Gay's signature mashups. This segment included a mix up of songs: Bruno Mars' "Just The Way You Are" with Fred Panopio's "Kawawang Cowboy", Beyonce's "If I Were a Boy" with Florante's "Akoy's Isang Pinoy", and Sharon Cuneta's "Bituing Walang Ningning" mashed up with the national anthem. Of all the segments, my favorite would be the Darna sequence. Ate Gay compared all the Filipina actresses who portrayed the fictional super heroine hilariously, including Vilma Santos, Nanette Medved and Sharon Cuneta. This was followed by the "Misyu" segment, a beauty pageant spoof, where he was joined by Kevin Balot as Miss USA, John Lapus as Miss Switzerland, Michelle O'Bombshell as Miss USA, and himself as Miss Nepal. The concert ended with Ate Gay's emotional tribute to the Superstar via "Handog" and "Minsan Ang Minahal Ay Ako". After the concert, I am so glad to hear no comparison between him and Vice Ganda. "Iba-iba and atake sa pagpapatawa", I remember Ate Gay once said in one of his interviews posted on YouTube. Vice Ganda's approach is spontaneous and uninterrupted while Ate Gay relies on mashup songs and side comments from movie moments of his idol Nora Aunor. Different really and comparing would be a stupid thing to do. Why don't we just root for both. After all, they only have one common goal and that is to make us all laugh.